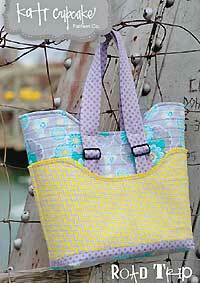 The Road Trip Bag Pattern by Kati Cupcake had instructions for lots of organizational pockets inside and a decorative curved top and matching outside pocket! There are double handles with bar slide buckles and a flat bottom, allowing you to see everything inside. Finished size is 13"W x 15 1/2"H x 6"D. A curved template is provided for the top of the bag. Stabilizers: Soft & Stable by Annie - 1 package 36" x 58"